On the leading edge of modularization in the auto industry, Filtran's Compact Oil Pan Housing with integrated SmartMedia® minimizes transmission wear and protects control valves from contaminants. Taking into consideration the demand on higher filtration needs related to more sensitive components while also considering the limited installation space, weight and cost reduction. A plastic oil pan module, which integrates a sump filter system which considers fine filter media in front of the hydraulic pump instead of behind it. In cold conditions, where the automatic fluid is highly viscous, most of the flow will bypass the fine media layers. But in operating conditions where the viscosity of the oil is much lower, a certain amount of flow runs through the fine filter media layers as well, so a high level of cleanliness can be achieved over time. This is done by having multiple flat layers, stapled in a progressive way for improved filter effectiveness, and placed in front of the medium-efficiency filter media, while the fine filter media layers incorporate partial flow openings (bypass orifices), which act as a self-regulating system. Filtran calls this extremely compact design of fine filtration inside a suction filter ‘SmartMedia®’. This clever solution increases filter performance by combining the benefits of different media types in one compact housing. It also provides benefits in terms of air extraction, avoiding pump cavitation and therefore reducing noise. 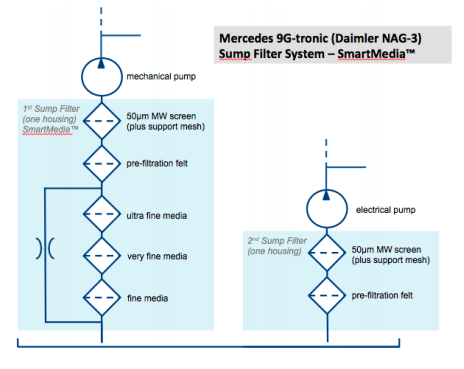 The SmartMedia® construction is only considered in the bigger, fully integrated, main suction filter in front of the mechanical pump. While the smaller secondary filter is mounted in front of the electrical pump, so that the position tolerances can be offset during assembly of the module to the transmission. Both filters are manufactured using clean laser-welding technology. Today, oil pan modules act as function carriers – here the pan includes a reusable twist-lock plug; devices for oil-level management; lightweight plastic bonded magnets for capturing of iron particles; integrated gasket; and outer fixing elements. This plastic oil pan module demonstrates the industry trend toward modularization and system supply, where interfaces and single components are eliminated. This means that the number of suppliers, logistical effort and assembly processes are reduced helping with budgetary requirements. And being designed in accordance with the injection molding process and plastic component design, this pan is 1.3kg lighter in weight and has additional integrated functions. In the future, a higher level of functional integration is achievable. Heat exchangers, sensors, valves and pumps could be adapted to transmission pans or side covers. Filtran continues to optimize this technology, through refinement of the design, materials and functionality of the final product. Since 2001, when Filtran brought the plastic oil pan module to market, it has produced almost 20 million units. In preparation for future demand, Filtran has added to its production capabilities in Germany, USA, China, Japan, Korea and has established a new plant in San Luis Potosí, Mexico.